following a win against St. Francis University on Feb. 28, 2018. 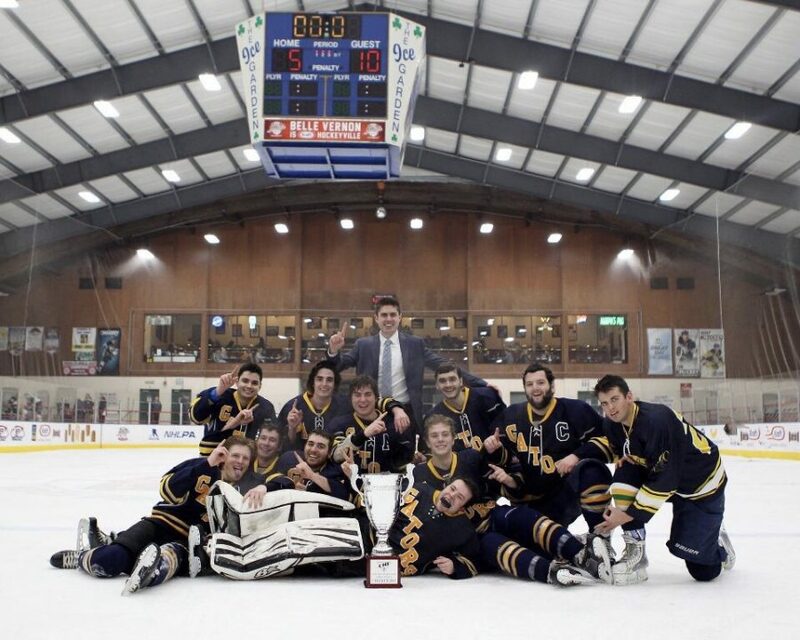 The Allegheny Club Hockey team provides players and coaches alike with a unique opportunity to be involved in the game they love. With this year’s team consisting of many of last season’s players, the older members of the team have welcomed a number of impactful first-year players. They collectively believe they have the foundations for a very strong and tight-knit squad this season, according to the team’s Head Coach Atlas Besenfelder, ’21. Some of the new faces on the team consist of winger, Jack Barron-Sluga, ’22, and defenseman Owen Harkins, ’21, among others. The players believe they have the foundations for a very strong team. The team combines players with prior hockey experience with players that do not have as much competitive hockey experience, but are learning on the job and fitting in well with the team, according to Eli Smith, ’21. Smith was adamant that he encourages first-years to come out and play on the team for a number of reasons. The team has a 3-0 start to the season, with wins by as much as eight goals, but Besenfelder said he is trying not to get ahead of himself and get too confident. The team competes in the College Hockey East league, is part of Division 5 and is the defending Division 5 champion, according to Besenfelder. Besenfelder also attributed some of the team’s success to a very strong first-year class, who he stressed has done a great job in contributing to the team. The team hopes to make the jump into a higher division in the coming years, according to Savino, in order to compete against even stronger teams. The weekly routine of the hockey team is generally not a huge time commitment, but enough of one to have fun and feel the excitement of competitive hockey, according to Smith. Practice is definitely a huge factor in the team’s success, but Besenfelder also highlighted the crowd and the amount of fans that come out to cheer the team on as an important part in winning and being successful.